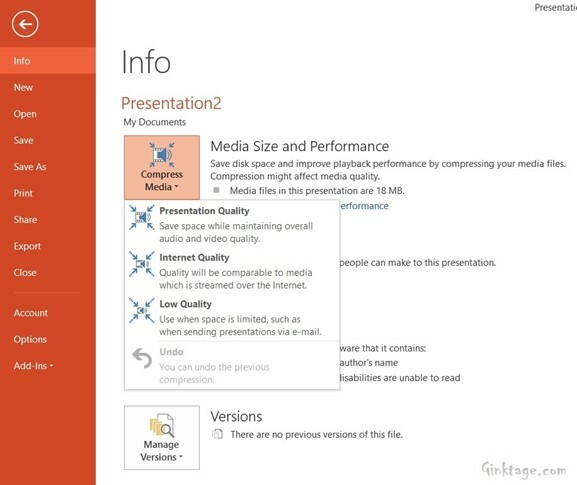 How to Reduce the Size of presentation File which contains media in PowerPoint 2013? This article will explain how to reduce the Size of presentation File which contains media in Microsoft PowerPoint 2013. There are times when the size of the PowerPoint presentation file might increase especially when you have lots of media files in your PowerPoint presentation file. This might result in difficulty to share specially when you want to send the presentation slides via email. One can reduce the size of the PowerPoint presentation file by following the below steps. 2. Open the PowerPoint presentation file that contains the media files like audio or video. 3. Click File Menu and click “Info” tab and then click “Compress Media” in the “Media Size and Performance. 4. Specify the Quality of the video like Presentation Quality, Internet Quality, and Low Quality etc. 5. 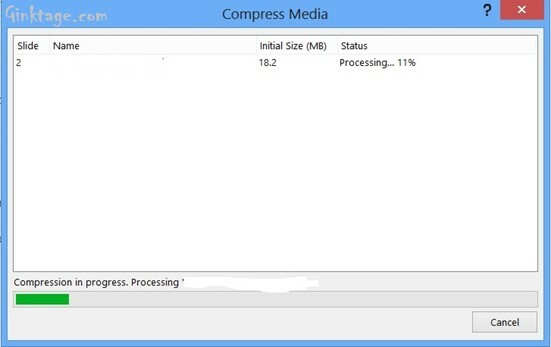 This will start the compress process to compress the media and within few minutes, the media files will be compressed in your presentation file.